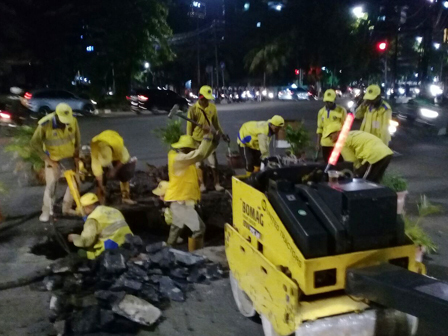 The Menteng Sub-district's Bina Marga Executing Unit, Central Jakarta, finally repaired the collapsed road in intersection of Jalan KH Wahid Hasyim, Kebon Sirih Urban Village.
" After that, we coat it with cold mix"
"At the same place, we actually have done repair thrice," stated Daktar, Head of Menteng Sub-district's Bina Marga Executing Unit, Wednesday (2/21). Mechanically, his side must firstly find the point of the collapse. And then the excavated soil is replaced with an ex-pedestrian concrete. "After that , we coat it with cold mix," he stated.